Will the Minister let us know what the Government intend to do to follow this up? This leads me to a wider question. In April of this incoming year, we are coming up to the 20th anniversary of the Good Friday agreement, and we are still talking not about criminality and gangsters—they will always be with us—but about paramilitary organisations. That is why there is a need for this order and that is why there is a threat. But let us analyse this for just a minute. We must recognise that, as the last sitting of the Northern Ireland Assembly—which was the first sitting after the Assembly elections—was in early March of this year, there is clearly going to be no Northern Ireland Assembly now into the summer. It will be at the earliest in September and, realistically, much later, before there is a Northern Ireland Assembly. Therefore, the only opportunity to scrutinise what is going on is on this side of the water. Indeed, there will be no possibility to ask any of these questions until September time, so another six months will have passed. We had all hoped that, after the Good Friday agreement, things would move reasonably quickly; they did not. From 2004 to 2011, I served on the Independent Monitoring Commission, whose job was to address the activities of the paramilitaries, the very people that we are trying to address in this order. At the end of that time, there had been a real improvement in the situation. However, by December 2015 it was necessary for me and two colleagues—John McBurney and Monica McWilliams—to return to the question, having been appointed by the First Minister, the Deputy First Minister and the Minister of Justice, to produce a strategy for the disbanding of the paramilitaries that are the cause of us having to bring this order forward. We were asked to produce a strategy and we produced the report by the end of May 2016. It was approved and the First Minister, the Deputy First Minister and the Minister of Justice committed themselves to action on 19 July 2016—almost exactly 12 months ago—and the British Government and the Northern Ireland Executive each committed themselves to £25 million over the following five years to address it. There was to be an Independent Reporting Commission. When the legislation went through this House—the Minister will not remember because he did not have this portfolio—I said that I did not believe that reporting once a year was enough; the Independent Monitoring Commission should produce reports twice a year. The Government said no, once a year, but it could be more often. The Independent Reporting Commission was not appointed until December 2016, six months after the report went through and the Northern Ireland Executive had accepted it. So, as it reports only once a year, it will be at least December 2017 before we have any report. That is 18 months on from things being put into place and yet the Minister finds himself having to bring forward legislation to address not ordinary organised crime but the paramilitary organisations. Are the Government satisfied that the report that was produced on disbanding the paramilitaries is being acted upon? There was to be a cross-departmental implementation board. Is that board meeting? We do not know. The Northern Ireland Assembly is not in a position to ask the question, so we have little alternative but to ask the question here. 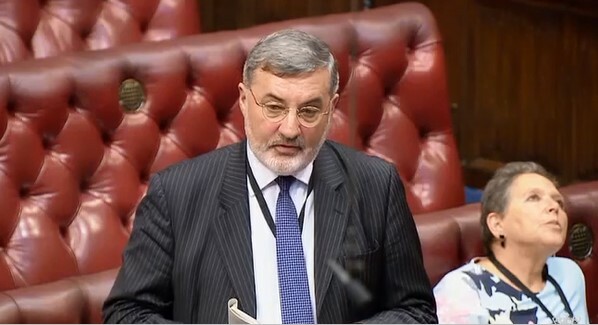 As the UK Government directly are putting in £25 million over the next five years—and, indirectly of course, the whole of the £50 million—there is a real interest in this House and in this debate in getting a response from the Minister as to whether the activities that ensure the requirement for this order are being addressed as we set out to do. Although the First Minister, the Deputy First Minister and the Minister of Justice at the time said, “Oh yes, there will be this implementation board and, in addition to that, the Independent Reporting Commission”, we have seen nothing from any of that. We are being asked, quite rightly, to renew this order because of paramilitary activity and yet complete radio silence seems to have descended since the report on the strategy for disbanding was presented last June and agreed by the Northern Ireland Executive last July. Can the Minister help us to address this question? Finally, when the IMC was disbanded—I know some noble Lords do not agree with me but, in my view, as a member of the commission, it was the right thing to do at the time—the Secretary of State for Northern Ireland undertook that every six months he or she would give a report on the activities of paramilitaries and the other issues which the IMC had reported on. Given the absence of reports for some time, the absence of anything from the Independent Reporting Commission and the absence of a Northern Ireland Assembly that can address that, can the Minister indicate whether it will be possible for us not simply to piggyback on the occasional order that comes through here but that we can properly address these questions when we return in the autumn? If the Assembly is not addressing the questions, some of us from Northern Ireland have to try to do so and make sure that something is happening, because departmental civil servants are supposed to be meeting and processing this, spending the money and, it is hoped, making some kind of impact.